I think I had been watching my feet, or maybe it was the dark back side of my eye lids…I can’t really remember because I was so caught up in the excitement and emotion. But when I finally looked up I was blow away. Literally – blown away. All strapped in, wind blowing through my hair, butterflies swarming around in my stomach a million miles a minute, and mountains as far as the eyes can see; I was paragliding. All I had to do was jog a few steps to get started and let the wind do the rest, but my legs were stuck…frozen. A few more deep breaths, that’s all I needed. “Vámanos” (let’s go) was the last word I heard before my legs instinctively began taking those big forward moving strides. We got to the edge and I thought my heart would jump from my chest before my legs would jump off that cliff; but then I didn’t have to. I was still running, but my feet were not touching the ground anymore. It was like I was gliding through a dream. The first paragliding experience of my life could not have been in a more beautiful location. The Bariloche lake region of the Andes Mountains of Argentina has stunning views from all directions, but it is definitely best from above. 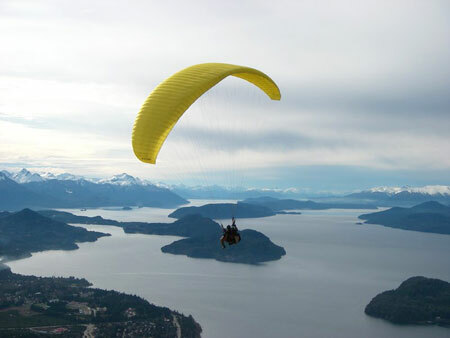 I had talked with fellow travelers about their paragliding experiences in Bariloche and I was anxious to gain the aerial perspective of this area that I had heard about. Victor was the Argentine flying guide who picked me up from Hostel 1004 with all his gear and preparations. The large windows of this beautiful hostel framed the scenery from the tenth floor of the highest building in the city. The views I had throughout my stay at this hostel foreshadowed the high-flying experience I would have before I left. On the morning I was scheduled to go, I noticed something new from the 10th floor – the clouds that had rolled in for the day. I was a little wary as to whether I should wait a day or two for them to clear up. While riding up to the take off spot in the passenger seat of Victor’s jeep I was informed that I could not have picked a better day. The clouds can obstruct the views a little, but with the clouds also comes a light wind that whips through the air, and whipped us through the sky. As soon as we were air borne I understood exactly what he meant. On a day that the wind doesn’t make an appearance the paragliding experience is a beautiful, easy glide down to the bottom of the mountain; but on a day like this I was in for a little more excitement. My heart beat momentarily slowed after take off and I had a few moments to admire the landscape; but that didn’t last long. One big breeze swept us up from the side and before I knew it we were upside down and turning it circles. It was a roller coaster ride through the sky. Looking down I almost forgot that I was attached to Victor whose professional experience provided me with the ride of my life. 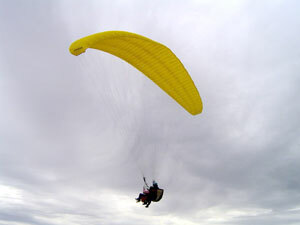 Just when I thought the wind had died and it was time to glide down to the bottom, a huge breeze would come out of nowhere and hold us in the air and send us in circles. The weather conditions were perfect. After twenty minutes of flying, Victor took us down to a graceful landing at the same spot I had to convince myself to leap from just moments before. My incredible retreat into the sky cost me 150 pesos but the experience was priceless. Who could I contact that is local about paragliding there? I am headed that way and would not know where to fly and it would be nice to have a flying buddy! 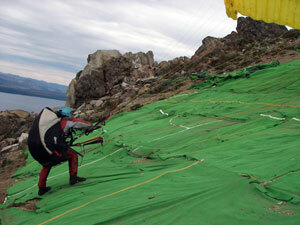 They are travel agents that could hook you up with the companies that offer paragliding. Sorry we don’t know the specific company that Vanessa went through because this article is from a while back. This page rendered in 0.579 seconds.